Combine some salt and sugar in a small bowl, and pour onto a small, shallow plate. Moisten the rims of 2 glasses with a piece of watermelon, and dip the moistened glass rims into the salt and sugar mixture; set aside. 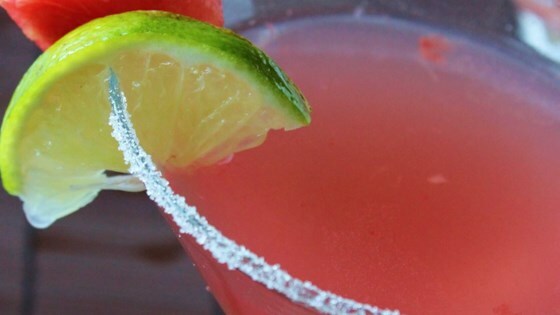 Pour the watermelon juice, vodka, watermelon schnapps, simple syrup, and lime juice into a cocktail shaker over ice. Cover, and shake until the outside of the shaker has frosted. Strain into the prepared glasses. To make watermelon juice, process chunks of seedless watermelon in your blender and then strain through cheesecloth. Make your own simple syrup with our recipe! I can't quite make up my mind about this one. It wasn't great and it wasn't bad. Since I didn't think it was great, it was way to much work to make watermelon juice, so I won't be making again. Love it! The only thing I changed was that I used melon flavored rum instead of schnapps since that was all I had. I used my juicer to get the melon juice. Yummy! Wonderful summer drink and I'm not huge fan of watermelon. Didn't like the salt sugar mixture so I just stuck with sugar.